They can and they normally should. A lot depends on the extent of the hernia, and BMI guidelines for repairing larger hernias together with a tummy tuck are normally somewhat stricter. The scar shown is the most frequently used extended cesarean type. The postoperative picture shows the appearance 5 months post op and does normally face much further in the following year. The scar should ideally be located as low as possible. 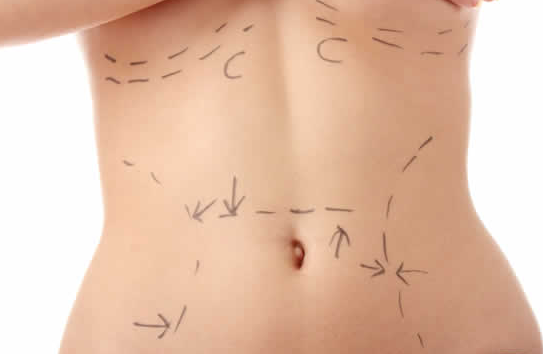 Especially in patients seeking abdominoplasty after bariatric surgery (gastric band) it is not uncommon to also find hernias of varying sizes, mostly umbilical hernias which can be repaired together with the abdominoplasty (tummy tuck) without problems. In some cases, and larger hernias, I use the deepithelialized dermis of the resected skin as a kind of natural mesh (so called coriumplasty) to reinforce the abdominal wall. This works as a kind of autologous (patients own tissue) mesh and gives very good results regarding abdominal wall stability after hernia surgery. We do usually see a significant number of patients every year who undergo, for example, inguinal hernia surgery, and want to use the possibility to kill two birds with one stone. Our audit data has shown that abdominoplasty surgery performed together with this procedure is not different to abdominoplasty alone.